Singlet oxygen evolution and detection using photon emission spectroscopy. Lithium-ion batteries promise to bring a revolution to our roads, but electric vehicles will need high power density at a reasonable cost and weight/volume. In current state-of-the-art Li-ion batteries, a graphite anode is paired with a cathode containing transition metal oxide materials to allow lithium ions to de-/intercalate reversibly as the battery charges and discharges. But one of the commonly used transition metals is cobalt (Co), which is costly. Reducing the Co content and increasing the nickel (Ni) content has an unfortunate side effect – the evolution of oxygen at low potentials – which impacts adversely on the battery lifetime. Now researchers from Technische Universität München in Germany have conclusively demonstrated, using photon emission spectroscopy, that singlet oxygen is one of the reactive species that produces a chemical reaction cascade and irreversible electrolyte oxidation [Wandt et al., Materials Today (2018) https://doi.org/10.1016/j.mattod.2018.03.037]. When singlet oxygen is released, it reacts with the electrolyte, serving to both consume the liquid electrolyte and, consequently, dry out the cell. Gas formation also leads to higher internal pressures and increases the cell resistance in addition to the resistance of the oxygen-depleted layer on the surface of the active material. Lastly, the products of cell decomposition can attack the active material chemically, leading to transition metal dissolution at the anode and loss of active Li at the cathode. 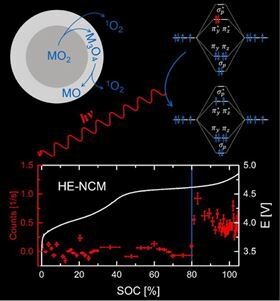 Freiberg and her coworkers’ latest observations are the first definitive proof of singlet oxygen evolution during charging of transition metal cathode materials and explain the accompanying electrolyte decomposition. “With this unambiguous proof of singlet oxygen evolution during the charging of layered transition metal oxides, a deeper understanding of the intrinsic aging mechanisms of these materials is on the way,” says Freiberg. The results point to the state-of-charge rather than the potential as the trigger for oxygen release. Stabilizing the lattice structure and testing the susceptibility of potential electrolytes to singlet oxygen should now be useful approaches to improving the life cycle of Li-ion batteries. With this new understanding, Ni-rich layered transition metal oxide cathode materials can be explored and optimized for battery applications to replace current high-Co content options that are too expensive for commercialization on a large scale.